Sunny Bill Du-Toy accepted into the Daily News 2000 Final Field! 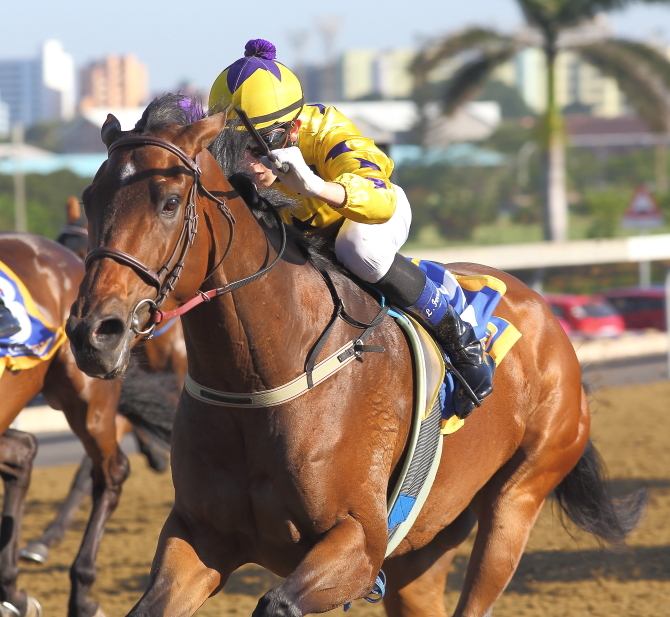 It’s official, SUNNY BILL DU-TOY has been accepted to run in the R2 million Daily News 2000 at Greyville on Saturday the 2nd June 2018! This will be his stiffest test to date for Sunny Bill Du-Toy, as he will be running against some of the best three-year-old colts and geldings in the country. S'manga Khumalo gets the ride, and will jump from stallgate 2. Sunny Bill cemented his place in the final field with his hattrick win against a strong MR80 field last Wednesday. Prize money aside, the race carries a lot of prestige with previous winners including the likes of Teal (1999), Dynasty (2003), London News (1995) and Dancing Duel (1992). All four winners went on to win the Vodacom Durban July. The Hollywood Syndicate is extremely excited about his date with destiny and we are confident that he will make a worthy account of himself. We are wishing all the best to trainer Alyson Wright and the Gee Racing team! He is currently on offer at 25/1 at Hollywoodbets! Bet now! ← Sunny Bill Du-Toy Gets His Hattrick!